After working with over 100,000 groups that have raised millions with our step-by-step Cookbook Fundraising Program, Fundcraft knows fundraising campaigns! We guarantee in writing that any fundraising group that follows our Original Cookbook Program will raise enough money to pay for the cookbooks or they can return the books for full credit. Our guarantee is very simple - the more books you order, the more recipe contributors you must have to sell the books. Note: It is not mandatory that our sales guarantee be followed in order to produce a cookbook. Many groups and individuals with recipe counts that far exceed the numbers listed in the guarantee have been very successful with raising funds from a personalized cookbook. The guarantee does not apply to reorders because generally they are funded with sales from the first order. The guarantee and the free features listed apply only to groups participating in our Cookbook Fundraising Program. 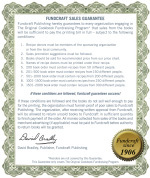 No other publisher comes close to the free features offered with the Fundcraft Original Cookbook Fundraiser Program!